Football season is over and I’m wrapping up my thoughts on the NFL. Other than my beloved Seahawks winning the Super Bowl, I had one lingering thought about the state of the NFL. While I am half-Japanese/half-Mexican, I am not the Politically Correct police. But, it’s 2014 and there’s still a professional sports team with a racial slur for a name. Like other newspapers and sports writers, I have taken to referring to them as the “NFL Team That Plays In Washington D.C.,” if I refer to them at all. As a kid growing up in the Pacific Northwest, there was a general awareness of the Native American culture and recognition of the culture’s influence on the area. The Seahawks logo and uniforms are respectfully infused with Northwest Native American art. So, I was surprised to hear that the D.C. professional team had a name that was so offensive. As I got older, I assumed it would eventually change. Many years later, shockingly, it’s still the same name. 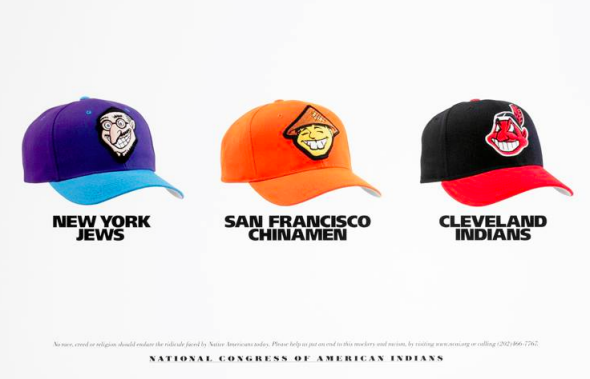 Here’s how you know if the name of your favorite sports team is racist. If the name is a racial slur, it’s racist. Duh, NFL Team in Washington D.C. I’d bet the house the N-word will never be the name of a professional sports team. If the name takes a race of people and turns them into a cute mascot, it’s racist. Since Native Americans generally consider “Indian” an offensive if not inaccurate term (Columbus thought he was in India. ), this would include the Cleveland Indians. Braves and Chiefs also come to mind. What makes the names worse is if the objectified race is a minority race, not in a position to have the sports image diluted by many other realistic and/or positive images. I’m assuming that’s why there isn’t much uproar over the Minnesota Vikings. Occasionally, a minority group endorses the seeming offensive name. Notre Dame’s Fighting Irish was a derogatory reference to all the Irish Catholics at the school, but the school took ownership of the phrase and made it a source of pride. The Florida State University Seminoles was granted an NCAA waiver to continue using the name/mascot because the local Seminole Tribe supported the University’s use of the name due to good relations between the tribe and the university. Other teams have long since moved on from their racist past and suffered no ill effects. Stanford University changed their mascot from the Indians to the Cardinal 40 years ago. In 1969, the Golden State Warriors replaced their feathered headdress logo with a Golden Gate Bridge logo, thereby neutralizing the racial content of the name. Seriously. “NEVER!” Well, until Mr. Snyder comes to his senses, succumbs to external pressures (I’m looking at you Roger Goodell. ), sells the team, or any combination of the above, I will continue to refer to them as the NFL Team In Washington D.C. At least, I can take comfort in the fact that as long as Snyder runs the Team in Washington D.C., they’ll rarely be relevant in football terms. Apparently some Senators agree with you. The NFL Team That Plays In Washington D.C. representative pointed out that the Senator was from Oklahoma which means “red people” in the local native american language.